2014 BMW 5 Series review | What Car? The executive car class is notoriously competitive, which means the instant one of the big German players seems to gain an advantage, its rivals are always close behind, with none of the brands willing to surrender any hard-won turf. Audi recently shook up the class with its latest range of ‘Ultra’ diesel models, which deliver, smooth, refined performance, along with impressively low CO2 emissions. However, BMW has countered by adding two new diesel engines to its 5 Series range. The 518d and the 520d both use the same 2.0-litre, four-cylinder motor as the latest X3 4x4 and 2 Series Active Tourer. It has a new turbocharger, and has been given a wide range of mechanical tweaks designed to meet strict new emissions regulations. There’s also a slight increase in power for both models, as they now produce 148bhp and 187bhp respectively, while the 520d has a useful 15lb ft of extra torque as well. 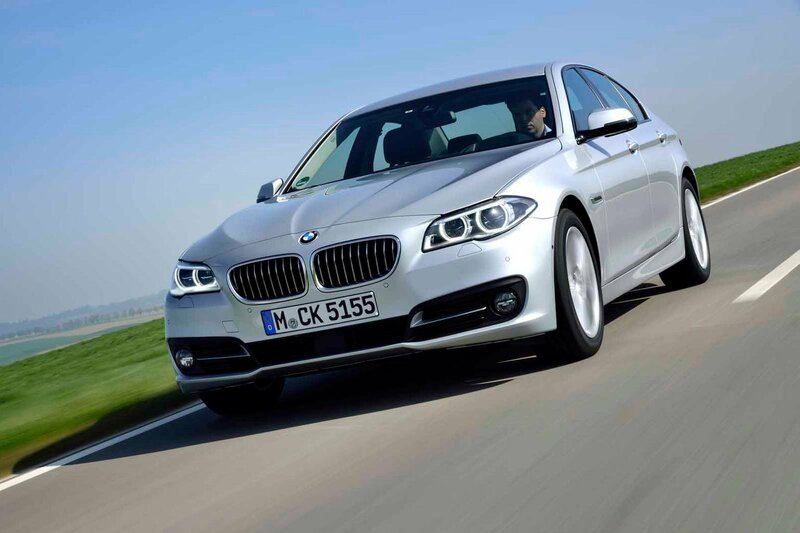 What's the 2014 BMW 5 Series like to drive? Despite the new engines, the driving experience is very similar to the previous model, which is no small compliment since the 5 Series was - and still is, as it turns out - the dynamic benchmark in this class. We tried both diesels paired with the optional (£1,550) eight-speed automatic. In both cars, choosing the auto ‘box improves straight-line performance and lowers the CO2 output, which in the case of the 520d means a 0-62mph sprint time of 7.7 seconds and emissions of just 109g/km. That sneaks it into a lower benefit-in-kind tax bracket than its arch rival the Audi A6 Ultra, which means the BMW will be a cheaper company buy despite its higher price. Manual versions are not quite as efficient, emitting 114g/km, but most fleet buyers will choose the auto, which we’d recommend. It’s smooth, responds quickly to driver inputs, and turns the 5 Series into a relaxed motorway cruiser. The 518d feels reasonably strong, and has enough power to hustle the 5 Series briskly along, but quick overtakes need to be planned more carefully, and it’s not as effortless at building up speed or kicking down through the gears as the more flexible 520d. On the move, you soon notice the other major benefit of the new motor: cruising refinement. Start the car up and it still fires with a distinct clatter, but once up to temperature, it settles quietly into the background, especially at low speed, where engine noise is well suppressed. Rev the engine a bit harder and it’s still not as smooth or flexible at high revs as the A6 Ultra, but the 5 Series still outclasses its rivals when it comes to handling. Accurate, weighty steering, a balanced chassis and rear-drive layout all give the BMW the edge over its peers, although it’s worth noting that our car came with the optional (£985) adaptive dampers. It’s an option we’d go for if you want to fit alloy wheels larger than the 17-inch rims that are standard on SE versions. Road and wind noise are moderate, and are easily ignored on a longer drive, while the ride – on our European test route at least – felt really well judged, as it soaks up mid-corner bumps while remaining taut and composed in tighter turns. What's the 2014 BMW 5 Series like inside? Not much has changed inside, but the only rival that can claim to have a classier cabin is the Audi A6, and even then the difference is marginal. The 5 Series has a higher list price, but gets Xenon headlights as standard, along with the leather, sat-nav and DAB digital radio, even on entry-level SE models. All versions come with BMW's class-leading iDrive infotainment system, which is controlled via a rotary dial (and surrounding buttons) on the centre console. It was recently updated too, so the 6.5-inch screen now has even sharper responses, high-res 3D maps, and an improved Bluetooth system with clearer audio streaming. The seats are no less successful, being comfortable and supportive, with lots of adjustment to help the driver get comfortable. Rear space is generous. There's enough room for two six-footers, and three will fit, but there is a large, wide transmission tunnel that eats into the foot well in front of the middle seat. A 520-litre boot means luggage space is on a par with that of rivals, too. Frankly, we struggle to see a reason not to. If you’re in the market for a fast, comfortable exec that’s also good to drive and cheap to run, there’s none better. The 518d is a nice entry point into the range, and priced to match smaller rivals, but the superior performance and class-leading efficiency of the 520d make the quicker car a more tempting proposition, and it will be cheaper for company buyers. While this new engine is not the most refined four-cylinder diesel around, it’s a step up from the previous car, and the rest of the 5 Series package is as convincing as ever.